I did more yoga today. I love the 20 minutes sessions. And my gosh my Down Dog has improved!! My heels were much closer to the ground today. Amazing! Today I did Gentle Hatha Yoga #2. I think I preferred the poses in Hatha Yoga #1 a bit more, but the variety is nice. And holy Camel Pose! 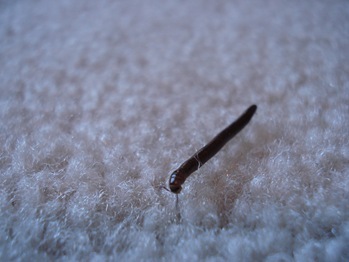 This little tiny creature was mocking me during my session with all kinds of backbends as he wormed his way across the carpet! For 3 days only, enjoy 50% off your entire order, including gift certificates, at YogaDownload.com. Get all those classes in your wish list, try a new class you’ve been interested in, try a new style, or challenge yourself and get a class that will encourage you to go to your edge. Now is the time to get yourself some new classes and SAVE BIG! Today’s oatmeal was fruitcake! A mixture of dried fruit and nuts. I can’t believe it’s already 10:00 and I’m just now finishing breakfast. I’ve got a few things to do today, and have a trip to the gym planned. I might hit up a group exercise class if there’s one starting close to when I get there. Kath, Happy Monday before Christmas to you too! That oatmeal looks and sounds so festive. I hope you have a great day! All of your yoga-ing has inspired me to get back on it! I haven’t done yoga in weeks (months?)! Glad you’re enjoying the yoga. I can’t seem to get into it 🙁 Oats look great! Hope you have a nice day!! So glad to hear how much your enjoying the Yoga! For your downward dog, try a little toe stretch before you start. Believe it or not, it has a lot to do with tight feetsies just as it does tight hamstrings! On your knees, kneel down with your toes curled under for a few minutes, and BREATHE! 🙂 Give it at least a few deep breaths, and then re-approach your DD! Good luck! Hahaha, you eat your oats… and enjoy ’em too! 🙂 yum! I would never throw away my oatmeal either!! Haha it seems wrong! I am glad you are enjoying yoga! So..I tried Yogadownloads the other day..downloaded a free program ,and was going to do it in next couple of days, well the next morning our computer had come down with a serious virus! Has anyone else had issues with yogadownload.com? I figured it was super safe since you and lots of other bloggers use it on a semi-regular basis. really I just want to prove my husband wrong that my yoga wasn’t what sent the computer over the edge! Allison, that stinks. I’ve downloaded quite a few of the free downloads from that site, and I haven’t had any problems whatsoever. Kath, glad you’re finding the yoga helpful. Also, I am totally obsessed with putting dried apricots in my oats. YUM! Kath – I’ve been adding a spoon of Nutella to my oats (Hazelnut Cocoa Spread)….Holy crap — soooo good! I’m definitely enjoying my oats more since discovering your site. I also love dried fruit on my oatmeal. Dried cherries are awesome. 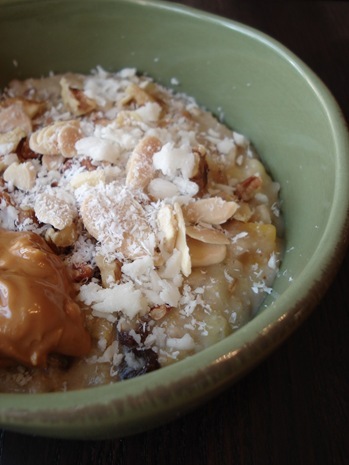 Yoga + fruitcake oats = divine!! 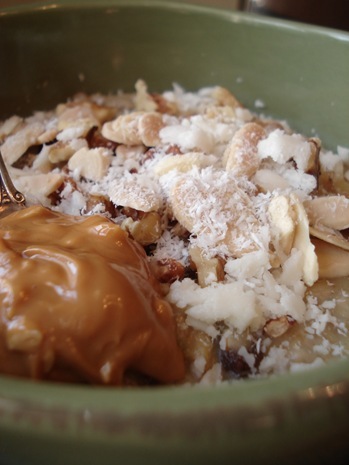 i love all your oatmeal concoctions! I need to become more creative with my oatmeal. Yuck – worm!! Did you keep doing yoga even after you saw it?! Eee. I would have kept far far away. Now that I’m officially on winter break, I’m catching up on your weekend’s posts. I HAD to comment on Serindipity….oh that is my all time favorite movie. I saw it 10 times in the theater when it came out! Last summer, Jon and I were in New York so of course I made him go the the actual Serendipity Ice Cream Shop and I CRIED just being there. It was so romantic, we took tons of pictures outside of it:) I had to share….I ws so excited to see that you love this movie, too! 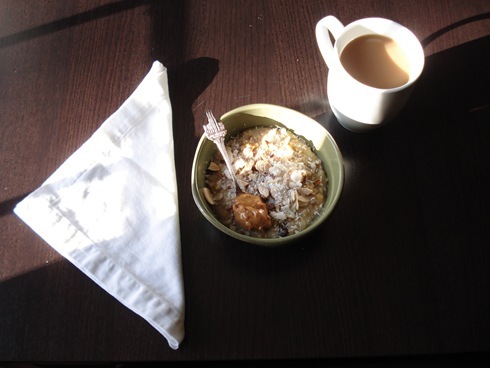 I love that fruitcake oatmeal idea—so good! And I’m right there with you, I’ll be damned if I don’t finish my bowl of oats in the morning, stuffed or not! Happy Monday-before-xmas to you too!! I def. need to give Yoga another chance after reading all of your posts! 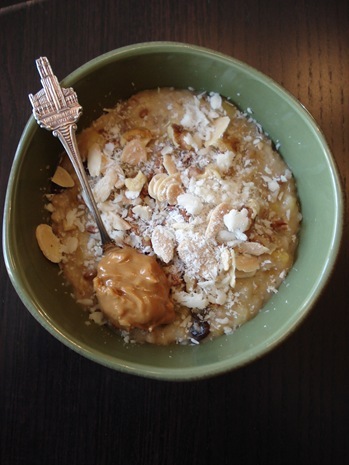 Your oatmeal looks great too! I make too much all the time but refuse to throw it away too!! Kath- so glad you are getting into yoga! It’s a great compliment to rounding out your exercise routine. I swear it’s what keeps my arms toned! Mmmm…CRACKER BARRELL! If you’re doing breakfast, you must try their biscuits! They come with the meal. Ask for their apple butter to have with them….yummmmmm. Everything is good there; it’s really true home cooking. I would say order something you don’t have the chance to cook often and that you enjoy…like pancakes! If you’re going for healthy, you could order egg whites and wheat toast or something similar. But try those biscuits!!! Hi kath! Interesting take on meat as a “multivitamin” . . . do you think you get all the nutrients you need from a multivitamin? I’m vegan and always worry that I’m missing out on some essential nutrients in food … but I do take a multivitamin! Oh I loved going to cracker barrell as a kid. Not the place to eat healthy even your egg whites would be fried in butter. I sa get something yummy and just control your portions. Enjoy the southern home cooking. I like grits, plain, but I’m weird. I have the same problem with yoga, my attention span. I have done an hour class but I get bored. I too did the free downlowds (bc Jenna was talking about them). The are a better fit. I may do one today my legs are stiff from running. Since I am on winter break, I made oats the way you do:stove top, equal parts water, milk, and oats, and 1/2 a small banana, whipped. OH MY GOD! It was so good!!! I am converted. I also think they get bigger if you cook them stove top. Kath! I LOVE yogadownload. I meant to comment a few posts ago about it. I do it almost every morning 🙂 It has saved my life, pretty much! I am so glad you enjoy it, too. And, I agree about the Hatha Yoga #2- I like the #1 practices much more. You need to try the Sun Salutations practices and the Hip Opening flows. Wonderful! And don’t you love the instructors? I am a member and I love it. I pay like 6.95 a month (I caught a good promotion) and I get to choose from up to 6 different classes a month! Have a wonderful day, love! i am going to try yogadownloads today! i’m excited! Matt and I want to know if you saved that nice bug from demise? We hope so, in the spirit of the season. I am in love with the yoga downloads right now, too! 20 minutes is the perfect after run stretch. Happy Monday before Christmas to you as well! Thanks for the tip! I have very still toes from my foot surgery and the tendons connected. I think that’s why I hate lunge poses – they hurt my toes the most! 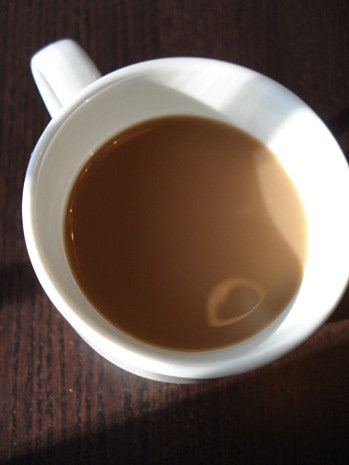 I have been to Cracker Barrel, but it was ages ago and not for breakfast. But sounds like the other readers gave good advice. I am always in favor of getting nutrients from whole foods. I only take a vitamin every few days in hopes that i get most of my nutrients from the foods I eat. Iron and calcium are concerns for women and meat + dairy are easy ways to get them, so as a vegan, you probably want to be extra vigilant about making sure you’re getting enough. Vitamin B12 as well. Maybe consider keeping a food journal for a few days where you can see a report of your nutrients and see how you’re doing. I’ve done this before with my nutrition software and it was very eye-opening (I was getting TONS of Vit. A but not enough Calcium even with milk in oats and yogurt almost daily). I did not kill him, but I think he is dying, as he’s all curled up now.